Capitalizing on rich industrial experience and strong networking sources, we present a qualitative assortment of Aluminum Taint Tabor Scraps for buyers in Thailand, Europe, Asia, Latin America and many more. 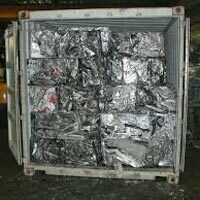 We assure that our Clean Mixed Old Alloy Sheet consists of two or more alloys and are free of foil, venetian blinds, castings, hair wire, screen wire, food or beverage containers, radiator shells, airplane sheet, bottle caps, plastic, dirt, and other non-metallic items. We are an eminent Aluminum Taint Tabor Scrap Exporter and Supplier from Thailand. Contact us for placing orders.